RICHMOND, VA -- Tim Kaine has an Election Day tradition when his name is on the ballot. The avid outdoorsman votes early, then goes hiking in the woods with friends and family for a few hours of calm away from the nervous last-minute energy of political campaigns. It's a ritual that's so far served him well: He's never lost a race in his rise from a part-time city council member in a medium-sized city to a short-lister to be the Democratic vice presidential candidate. It's also the mark of a man, friends say, who is not wedded to a political life and would be happy doing many other things. "One of the wonderful things about Tim is that he does not need anybody's title," said Tom Wolf, a former law partner and longtime friend. "You could sit next to him on a cross-country flight, and he would never tell you that he was a Virginia governor or a U.S. senator." That grounded approach has helped explain Kaine's appeal in swing-state Virginia, where he served as governor from 2006 to 2010 and was elected to the U.S. Senate in 2012. And it's why he's considered a likely choice to be Hillary Clinton's running mate. In Kaine, Clinton would be selecting a steady and well-practiced politician. His supporters say Kaine would excel in the national spotlight, and his down-to-earth persona, self-deprecating humor and habit of breaking out a harmonica at campaign stops will help him connect with voters around the country. A whip-smart Harvard Law School graduate, Kaine speaks with ease while campaigning, rarely needing a prepared text. His remarks at Virginia Tech the day after one of the worst campus shootings in modern U.S. history won wide praise. He speaks openly about his faith and its impact on his views on social justice. He and his wife, Anne Holton, are longtime members of Richmond's St. Elizabeth Catholic Church, a predominantly black congregation in a poor part of town. And as a private attorney before he entered politics, he made a name for himself advocating for fair-housing. Raised in Kansas City, Missouri, where he often worked in his father's welding shop, Kaine came to Virginia after meeting Holton at Harvard. She is the daughter of former Virginia Gov. A. Linwood Holton Jr. and currently serves as Virginia's secretary of education. They have three children; their eldest son, Nat, is serving as a Marine. 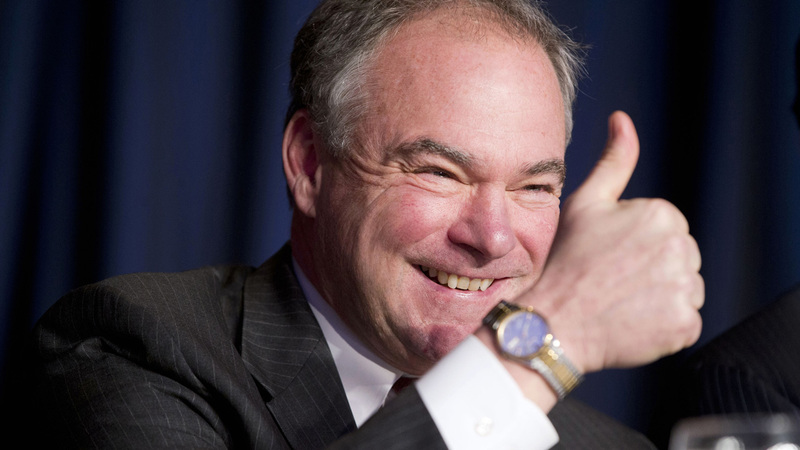 Kaine has had a somewhat charmed political rise. After serving as a Richmond city councilmember and part-time mayor, Kaine became the Democratic nominee for lieutenant governor when the presumed candidate dropped out following a cancer diagnosis. And Kaine's election to the Senate was only possible because the incumbent unexpectedly decided to leave after one term. In one of the most divisive elections in recent history, Kaine's political style would also stand in stark contrast to presumptive Republican presidential candidate Donald Trump's often incendiary rhetoric and aggressive, personal attacks. Friends and colleagues describe Kaine as someone who prides himself on his ability to work with a broad spectrum of political adversaries. "He's a terrific listener," said Mark Rubin, who was a senior adviser to Kaine as governor. "His style is to be collaborative and to work with friends and opponents." But beneath the nice-guy image, friends said Kaine isn't afraid of throwing elbows while campaigning and has a strong competitive streak. He's shown he can win close elections in a swing state, including a bruising and expensive Senate contest. And since arriving at the Senate, Kaine has been working to expand Congress' role in voting for and declaring war, an effort that put him at odds with the White House. Kaine is a close ally of President Barack Obama, who seriously considered Kaine as his running mate in 2008. It's another example, friends said, of Kaine's self-assuredness. "If Donald Trump is the Republican nominee, I think he would have a hard time getting under Tim Kaine's skin," said John Watkins, a Republican former Virginia state senator.